IDT provides our customers with critical tools to analyze the genetic makeup of all organisms. Our products are used to solve a spectrum of problems, from finding cures for diseases to identifying new species to finding new biological solutions for cleaning up our natural resources. In 2016, we conducted a materiality assessment to determine what aspects of sustainability most significantly impact our business and our stakeholders. Once determined, we used these aspects and our overall corporate strategy to define our 2017 sustainability strategies. A third party facilitated the materiality assessment to objectively determine our sustainability priorities. Joseph A. Walder, MD, PhD and Baxter Healthcare Corporation founded Integrated DNA Technologies in 1987. A holder of numerous patents and formerly a professor of biochemistry at the University of Iowa College of Medicine, Dr. Walder established the University’s first facility for nucleic acid synthesis, and pioneered breakthrough technologies. Early in his research career, Dr. Walder made contributions to the field of antisense technology. This technology became a critical tool for discovering the functions of many of the genes identified through the Human Genome Project—the world’s largest collaborative biological project that determined the sequence of the more than three billion base pairs that make up human DNA. In 1992, IDT began offering high quality custom oligonucleotide probes and primers as commercial products. Staff at IDT developed an economically efficient method of production. Proprietary re-engineering of synthesis equipment and specially formulated synthesis reagents, coupled with other advances in quality control, have helped IDT earn a reputation for superior product quality and value-added customer and technical service. 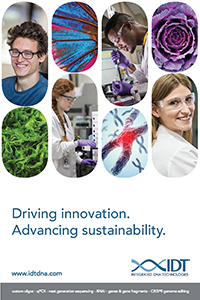 Today IDT remains a privately-held company and a world leader in manufacturing and delivering custom nucleic acid products, as well as a recognized innovator of a broad array of genomics-based solutions. In 2016, we conducted a materiality assessment to determine what aspects of sustainability most significantly impact our business and our stakeholders. Information gathered from research, benchmarking, and internal and external stakeholders was synthesized and quantified, leading to the identification of our complete value chain, sustainability focus areas, and material topics. Employees worldwide embrace health, wellness, volunteer, and team building activities. Facilities promote health and wellness through various events, contests, and fundraisers. Blood donations, fun runs, golf outings, and educational seminars discussing disease prevention, healthy eating, and weight control, among other topics, are just a few activities hosted across the organization. Through our scientific expertise and strong financial performance, we are well positioned and committed to investing in and strengthening the scientific community. We invest in several different ways, from dedicating financial resources and products to lending our expertise. IDT leadership sets a clear tone in support of investing in sustainability. This extends to environmentally-favorable building design, equipment, processes, and practices. Our worldwide efforts to reduce our footprint demonstrate good stewardship of the planet’s resources and provide a means to unite employees around a global cause. At IDT, our Environmental Management System (EMS) follows the ISO 14001 standard for environmental management. Our goal is to improve our efficiency and lower our environmental impact across all IDT facilities. As we expand in both size and scope, we are investigating ways to establish best practices in managing, measuring, and reducing our impacts on the environment.